As such an old topic but came in news against because Mamata’s election rallies in India & Protests in Bangladesh. Teesta originates from Kangse Glacier, Charamu Lake in Sikkim, most of its catchment area lies in India. It enters Bangladesh, joins Brahmaputra, and ends in Bay of Bengal. After Brahmapurta, Ganges and Meghna; Teesta is the 4th largest river in Bangladesh. W.Bengal government began constructing a barrage and catchment area on Teesta. 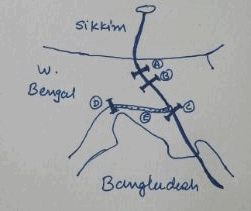 Bangladesh opposed, because their “rice bowl” Rangpur region depends on Teesta. To pacify them, India began negotiation. But problem unsolved, because Bangladesh wanted equal sharing. 1984: Joint-river commission appointed to collect hydrological data & suggest a rational method for water sharing. Commission recommended increasing Bangladesh’s share, on logic that W.Bengal’s barrage is very close to Bangladesh border (~90 km). Some water will penetrate underground and benefit both countries anyways. Jamaat-ud-Dawah (JuD) calls Pakistani poliitcal establishment to stop Indians from constructing dams on rivers flowing to Pakistan, raise the matter in UN, asked civil society(!) to support this cause. And even suggested that Kashmiri Mujahideen should be given a “Free hand” to destroy Bhakra dam! Mohan plans to visit Bangladesh, sign accords for Teesta and Land border disputes. He invited five state CM that share border with Bangladesh, to join him in this visit. But on eleventh hour, W.Bengal CM Mamata Banerjee dropped from this visit to protest against Teesta sharing agreement. This treaty will dry out Northern region of W.Bengal & hurt Indian farmers. 1998: Bangladesh’s largest irrigation project “Teesta Barrage” began. With help of this water, Bangladeshi farmers already have three cropping seasons per year. So, they don’t deserve any more water. At that time, Trinmool Congress was the single largest coalition partner in UPA, therefore Mohan had to drop the Teesta accord. He could only sign Land boundary agreement with Bangladesh. ^Ok this is upto 2011. why is the topic in news in 2014? BIMSTEC summit held at Nay Pyi Taw in Myanmar. Mohan assured Haseena about early conclusion of Teesta accord. Mamatha tells voters to “teach a lesson” to Congies. Because otherwise next Congi PM will sign Teesta accord = Northern parts of W.Bengal will become dry, water shortage for drinking and irrigation. Terrorist Parties like Jamaat-e-Islami & their supporters like Khalida Zia have started Dharna pradarshan in Dhaka’s Jantar Mantar. 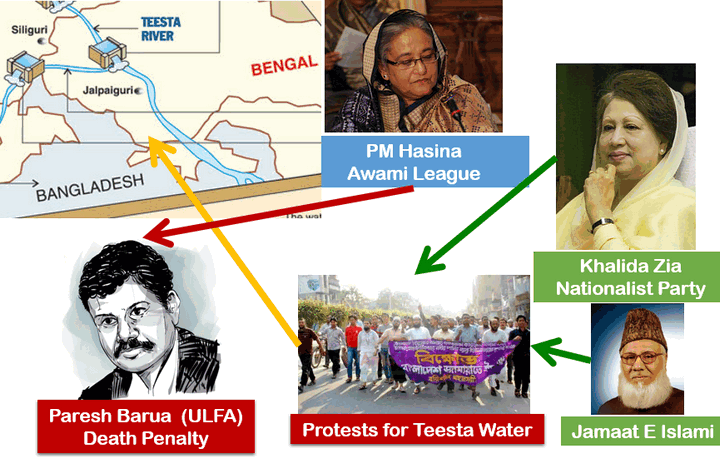 Their claim “India has reduced releasing water from Teesta but Hasina’s “Secular” Bangladesh Awami League party is doing nothing to get fair share from Teesta. Bangladeshi paddy farmers are suffering!” (Recall the same propaganda by Jamaat-ud-Dawah (JuD) in Pakistan in 2010. Hasina will visit India. Irrespective of whether Teesta accord is signed or not- topic will keep re-appearing in THEHINDU and hence will remain important for UPSC Mains-2014 & Interview 2014. Teesta originates from Sikkim & joins Bramhaputra in Bangladesh. It is an important irrigation source for paddy farmers on both sides. In the 80s, India & Bangladesh signed ad-hoc agreement to share 39% & 36% of Teesta water respectively. Later, Joint river water commission was setup to collect hydrological data & suggest a rational method for water sharing. 2011: New formula proposed- India & Bangladesh to get 42.5% and 37.5% respectively. But due to opposition from West Bengal state government, and its CM being the single largest coalition partner in UPA, this deal could not materialize during PM Manmohan Singh’s official visit to Bangladesh in 2011. 2014: Bangladeshi Extremist outfits like Jamaat-e-Islami have tied with Opposition leader Khalida Zia. They began large scale protests & political mobilization against current PM Sheikh Hasina, for her failure to carry out Teesta accord, hurting Paddy farmers & “selling” their country to India. In past, Jamaat-ud-Dawa & Hafiz Saeed have used similar propaganda tactics to promote hatred among Pakistanis against Indian dams. PM Hasina is an important ally of India. She has adopted zero tolerance policy against Anti-Indian terror outfits. Only under her regime, HuJI terror leaders were arrested, ULFA was banned & its chief Paresh Barua was awarded death penalty. Without such liberal-secular regimes in neighboring countries, India cannot become terror-free. Therefore India needs to take proactive steps for early conclusion of Teesta agreement, to show itself as a good neighbor and prevent resurgence of extremist parties in neighborhood. Update: had to make some fixes in the site theme. IF the site is not displayed properly in your browser – clear cache (control+shift+del key together). abhi time dikh raha he comments ke saath…. please anybody tell me why they are writing this article foe which exam for ias? @Dhajan, as such these articles are meant for UPSC’s IAS exam. But they’ll benefit you in preparing current affairs for other competitive exams as well- especially at interview level. NIce Graphics presentation of topics. sir, could u please tell all the sources for your current affairs newspapers,websites? Its frustrating that i only know just half of the topics in current affairs.i keep reading from hindu,idsa,diplomat,frontline and jagranjosh and still some of the articles you post are hardly mentioned in any of them. Why this weird look of your website. guys please confirm is some problem in UI. wonderful post , sir!!!!!!!! we are very oblique to u and ur team , sir!!!!!!!! Excellent work sir.. Thanks a lot..
Incidentally, Cholamu lake is also the highest lake in India. mrunal bhai, i hope you still remember me. you are doing a fantastic job. i am deeply indebted to you. i am a ’12 batch Assistant Commandant. sir whistle blower protection act pe article,kab post karenge?? Sir, Thanks a lot for wonderful insights. There is one small correction. In the timeline of Teesta River Water, it should be 2013 instead of 2014 in two of the main headings. Sir, I think our country is not on the top in peacekeeping force troops. Kindly tell me the exact rank of our country in it. Great Work Sir….I am a regular reader of your posts..Thanks for sharing such informations…. Thanks mrunal for your guidance. Can anyone tell, what is the maximum number of constituencies from which a single candidate can contest general election ? For instance, honourable Mr. MOdi contested from 2 consties.. kindly discuss. Ias ki date 24th August hi ha na?????? As I go through your articles I’m reminded of Einstein’s quote- “if you can’t explain it simply, you don’t understand it well enough “. The comprehensiveness and clarity with which you present the topics go a long way for many of us, helping in our preparation. Although it is to supplement and not to substitute our own efforts, it goes without saying that yours is absolutely invaluable and deeply appreciated.